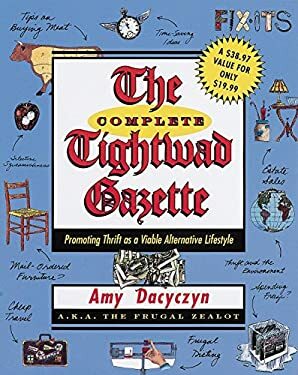 I don't know that you can consider yourself a 'true' penny pincher, money-saver until you've read haven't read the Tightwad Gazette by Amy Dacyczyn! And...once you read it, you may realize that all of the great new tips you read on money saving blogs aren't really THAT new. This book is jam-packed full of money saving tips, some that might seem a little extreme to some, but the majority of the ideas are very reasonable and applicable! And...depending on how much of a 'frugal zealot', certain ideas labeled 'extreme' by some may not be considered so 'extreme'. For example, dumpster diving isn't really something I'd like to do, but it can result in some great treasures, for free! WARNING: this book is 900+ pages long. So, it will probably take you a while to get through it! As I was reading through the book, I jotted down some tips I thought would be easy to implement in our lives to help us save money. These were things that I knew would be easy and fairly effortless to do! And while I don't know that they will save us a lot of money in the end, it's important to remember that little savings add up! Clothing Inventory: With a new baby coming, and a lot of unsorted baby clothes...I was a little overwhelmed! Organizing them, and compiling my inventory helped me see what I did and didn't need. Now, when I go to the store and see an outfit I want to buy, I can't blindly justify it by saying well, I probably need this for the baby (for better or worse!) Instead, I can know exactly what to look for to finish of the baby's wardrobe! And, it has helped a lot with my son's clothing, too. Once Garage Sale season starts, I will bring my clothing inventory with me so I buy the right amount of the stuff I need! Powdered Milk: This is one thing I thought I would never do- I remember drinking powdered milk a few times when I was growing up and I hated it! And, my husband is a little picky about his milk. If I were to replace his milk with powdered milk, it might result in a a divorce. But, having a pitcher of powdered milk in the fridge to use for cooking is definitely doable! I've already been able to cut the amount of milk I buy in half, which probably saves a little more than a dollar a week. Cloth Diapers? : In theory, they sound great, and the money saving makes them seem a lot more appealing to me. But, then I woke up and realized I was being crazy. I don't think I'd enjoy doing cloth diapers, and love being able to throw disposable diapers away! So...sorry earth, and budget. No cloth diapers for me! Gardening: This is one I won't really be able to do for a while, since we live in an apartment complex. But, I think I'm going to try planting a few herbs to keep on my patio this summer. This will be more for fun than to save money. Cheaper Breakfasts: I spend a lot of money on breakfast cereal! My husband eats it every morning for breakfast, and sometimes I do too. However, even with double coupons, it is one of the more expensive 'breakfast foods'. Once again, my husband is a little picky with certain foods. So, rather than enforce a no cereal policy, I decided that I'm going to try having 1 day a week where we eat like poor people. I call it Waffle Wednesdays. We'll either have oatmeal or muffins for breakfast, peanut butter sandwiches for lunch, and waffles or rice and beans for dinner. If it goes well, I may start increasing the number of days we have cheap meals, but we'll have to see. I think a happy husband is well worth the few extra dollars a week for milk and cereal. Using Less Dishwasher Soap: This is one I'm going to experiment with. We seem to go through dish soap pretty quickly, and if I could get my dishes clean with half the soap, that would be great! Not Rinsing: I am in the habit of rinsing off my dishes before I put them in the dishwasher. After reading this book, I realized that not only did it take more time, it costs more money! That was finally reason enough for me to justify not doing it anymore, even though I like my dirty dishes to look 'clean' when they are in the sink. My husband didn't every verbally say "I told you so", but I'm pretty sure he was thinking it. Overall, I really like the tone of this book. She mentions many times that being frugal has allowed her and her husband to realize their dreams, and they have a lot of fun being frugal! One other point she stresses is the possibility of living on one income, especially when you have children. When you factor in all of the additional expenses of having two working parents, it might not be worth it! While the money is helpful, the peace of mind, freedom, and happiness is much more rewarding. You might want to rethink the powdered milk—it has gotten more expensive since that book came out, and when I priced it a few years ago, it was almost the same price as liquid milk. So I don't bother with it. Also, your Waffle Wednesday sounds like a recipe for lethargy. Cereal isn't a very good breakfast because it is basically all carbs. You need protein first thing in the morning; we often start the day with a poached egg or cottage cheese with fruit, plus some good brown bread, which is a much better breakfast than a bowl of cereal with milk, from both a nutritional and a taste perspective. Greek-style yogurt (I make my own) with applesauce is another good possibility, and there's always breakfast burritos. I recently re-read The Tightwad Gazette for the first time in over a decade. I'm amazed at how well the advice still holds up despite being over 20 years old. It really is a great book for anyone looking for more ways to save. Be careful about powdered milk! In my area, powdered milk costs more than the "real" thing when you work out the cost per gallon reconstituted. As for cereal, once you have the baby, you may be able to go on WIC, which will provide you with more cereal per week than you can stomach. What I've done about breakfast is come up with a weekly rotation of seven breakfasts that I don't mind making (oatmeal, eggs and toast, french toast, rice, eggs and homefries, pancakes, muffins). 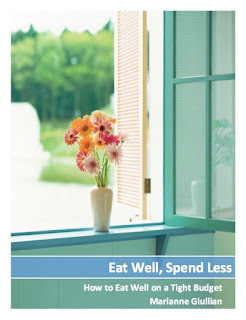 It's pretty inexpensive, healthier and more filling than cereal, and ensures that it gets done most days. There's also room for variation (kind of muffin, how the eggs are prepared, etc.). Finally, I use traditional, flat-fold diapers (the kind with the pins) most of the time, and it's really not that bad. If you have an extendable shower head that can reach to the toilet, it's even easier (I used to have a nozzle that was attached to the water valve on the toilet, which made hosing off the soiled diapers a breeze--gee I miss those days!). I also use disposables when the baby is sick or we are going to be in the car most of the day. Personally, I find it easier and less unappealing to deal with cloth than with plastic. I think the lack of circulation makes the disposables smellier.